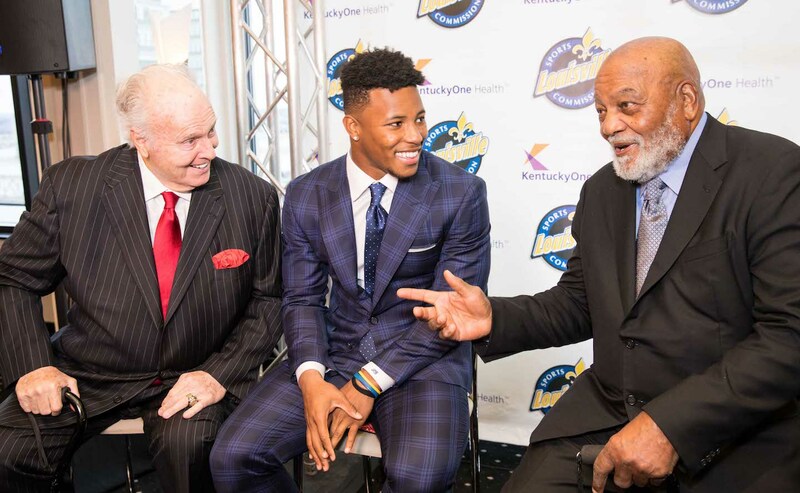 McCafffrey and his family will be honored on Feb. 25, 2016, at the annual Paul Hornung Award Banquet presented by KentuckyOne Health at the Galt House Hotel in downtown Louisville. A fleet-footed and rock-solid athlete from Castle Rock, Colo., McCaffrey was named Pac-12 Offensive Player of the Year, MVP in the conference championship game, CoSIDA First Team Academic All-America and finalist for the Heisman Trophy, The Doak Walker Award, the Maxwell Award and the Walter Camp Award. He also earned All-Pac-12 First Team as a running back and return specialist. One of college football’s most dynamic players on offense and special teams, for the season McCaffrey amassed 3,496 all-purpose yards with 1,847 rushing, 540 receiving and 1,109 return, breaking Barry Sanders record of 3,250 set in 1988. McCaffrey scored eight touchdowns rushing, four receiving, one on a kickoff return and threw two touchdown passes. McCaffrey recorded 200+ all-purpose yards in four games (Arizona, Colorado, Oregon, Notre Dame), 300+ all-purpose yards in four games (Oregon State, UCLA, Washington, Cal) and had a career night in the conference championship win over the Trojans: a school record 461 all-purpose yards on 207 rushing, 105 receiving, 120 in kick returns and 29 in punt returns; and accounted for a touchdown rushing, receiving and passing. For the season, McCaffrey set a Stanford record with 10 consecutive games of 100+ rushing yards and set a single-game record with 243 rushing yards on 25 carries versus UCLA. In two games he recorded 100+ yards both rushing and receiving, and he is the only player in the FBS to lead his team in both receiving and rushing yards. The Cardinal finished the year 11-2, won the Pac-12 North and the conference championship and are headed to the Rose Bowl to face Big Ten West winner Iowa on Jan. 1. 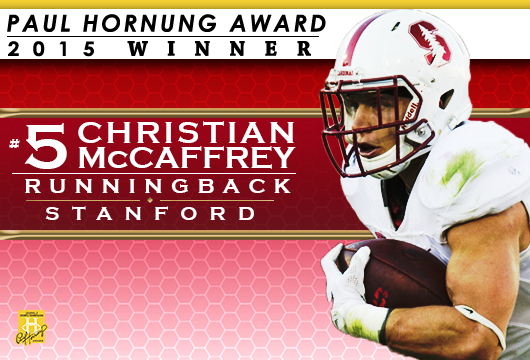 McCaffrey was chosen as Paul Hornung Award winner from among four finalists by a 16-member national selection committee comprised of sports journalists, coaches and retired NFL players; online fan voting accounted for a 17th vote. All votes were independently tabulated by regional accounting firm Dean Dorton, one of the largest accounting and advisory firms in Kentucky, with offices in Louisville and Lexington. The other 2015 Paul Hornung Award finalists were: Adoree’ Jackson (Southern Cal); Robert Nkemdiche (Ole Miss); and Jabrill Peppers (Michigan). Owen Marecic of Stanford, a two-way starter and All-Pac-10 performer at fullback and linebacker, won the inaugural Paul Hornung Award in 2010; Brandon Boykin of Georgia won the award in 2011 after excelling on defense, offense and special teams; Tavon Austin of West Virginia won the award in 2012 as one of two players in the nation with more than 500 yards in three different categories (rushing, receiving and kick returns); Odell Beckham Jr. of LSU won the award in 2013 after finishing the season ranked second in the nation and first in the Southeastern Conference with 2,222 all-purpose yards and 185.2 average yards per game; and Shaq Thompson won in 2014 earning first team All-America at linebacker, finishing the season as the Huskies’ second leading rusher with 456 yards and scoring four touchdowns on defense and two on offense. Past winners and finalists who have made their mark in the NFL include Boykin (Philadelphia /Pittsburgh), Austin (St. Louis Rams), Beckham Jr. (New York Giants), Thompson (Carolina Panthers), Nebraska’s Ameer Abdullah (Detroit Lions), Stanford’s Ty Montgomery (Green Bay Packers), Missouri’s Marcus Murphy (New Orleans Saints), Western Kentucky’s Antonio Andrews (Tennessee Titans), Texas A&M’s Johnny Manziel (Cleveland Browns), Arizona State’s Marion Grice (Arizona Cardinals), Kentucky’s Randall Cobb (Green Bay Packers), Oregon’s LaMichael James (Miami Dolphins) and TCU’s Jeremy Kerley (New York Jets).